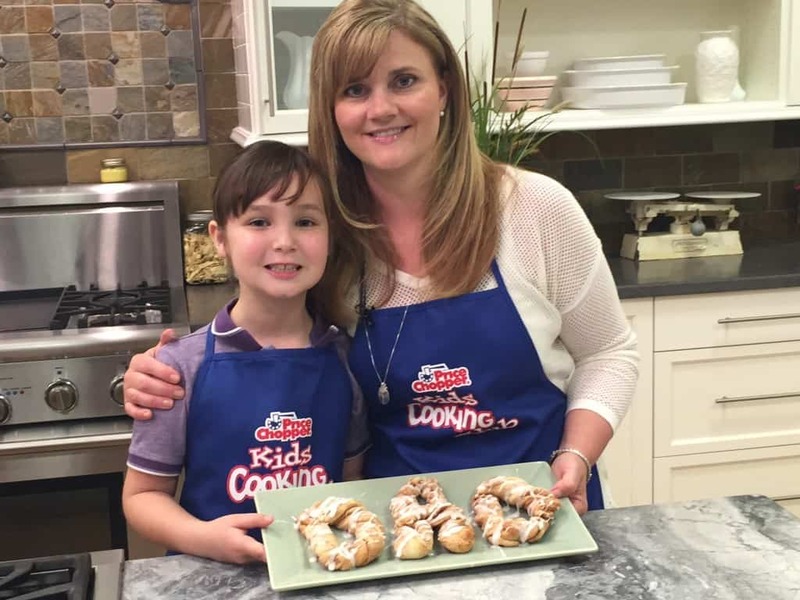 We had so much fun this past month getting ready for Father’s Day at the Price Chopper Kids Cooking Club kitchen. Sydney helped me start dad’s morning out by helping me to sprinkle, roll & bake this Quick & Easy Cinnamon Stick Recipe for breakfast that we twisted & shaped into letters to spell ‘DAD’. The entire family will enjoy creating & eating this breakfast together on Father’s Day. You can watch Sydney at work prepping this sweet meal in the video below and then grab the recipe for your own festive making YUM! On a floured surface, roll the pizza dough into a rectangular shape. Stir the cinnamon and sugar together & sprinkle generously on to the pizza dough. Using a pizza cutter, cut the covered pizza dough into strips. Food each strip in half and twist the dough. You can bake the dough in twists. 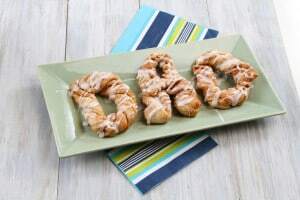 Or, you can take the twists and spell the word DAD for a fun treat the entire family can snack on for Father’s Day. 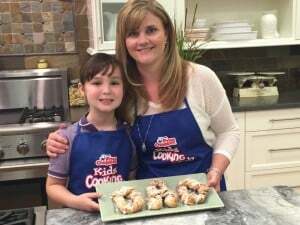 If you are spelling the word DAD to bake your twists, pinch the dough tightly together where the dough connects in each letter. Insert a plain wooden toothpick to help keep the dough together in the baking process. Remove the toothpicks before serving. Place the Cinnamon twists on to a baking sheet coated with non-stick cooking spray. Bake for approximately 20 – 25 minutes; until golden brown. Mix the confectioner’s sugar & milk together. Drizzle the glaze onto the baked cinnamon sticks. Let set for 15 minutes and serve. NOTE: You can baste the pizza dough with a light coating of melted butter or canola oil before adding the cinnamon & sugar if preferred; we typically don’t do this, but it can be added for flavor if desired. So cute! I love this extra touch for Father’s Day! Thank you – cinnamon sticks is one of our dad’s favorite treats! Thanks Diana – hope all is well :)! What a fantastic idea! I love it that it is something that the kids can jump in and feel proud to participate with. Thanks for sharing. Stopped by Via Too Cute Tuesday. Agreed – the KIDS always love to share their handiwork & they should be proud of their efforts…. :)! Thank you for sharing this idea. I’ve been searching for something simple my young boys could help with but would still be appreciated by my husband. I think I’ve found a winner! Aww what a sweet idea! Thanks for linking up to the Bloggers Brags Pinterest Party. I have pinned to the Bloggers Brags Broad. It isn’t Father’s day here until September but I will be using this idea then. This is so fun! My hubby has always said that the way to his heart is through his tummy… I think this may do the trick! 🙂 Thanks so much for linking it up at Tips & Tricks last week. I’m going to pin it, now. Hope you’ll join us again this week? The party is live, now! I hope you enjoyed-jusr realizing as I am rotating things on the site that I did not respond to your message sooner (so sorry)! Hope your summer was awesome….